It’s that time of year where I make some Christmas cards for a select few. I made a total of 4 this year, and this one was for S. She’s received it a while ago now, so it’s safe to post it. And from her response she really liked it. Done using black cardstock, homemade glitter paste, pearls, rhinestones and gold ink. Day 17 is a fail, didn’t know where I was go with this one, so she looks stiff and disproportionate. Tomorrow will hopefully be better. Also I think I’m starting to get sick. FW Acrylic ink, Water, Brush, Kuretake Brush Pen in Wine, and White Gel Pen. 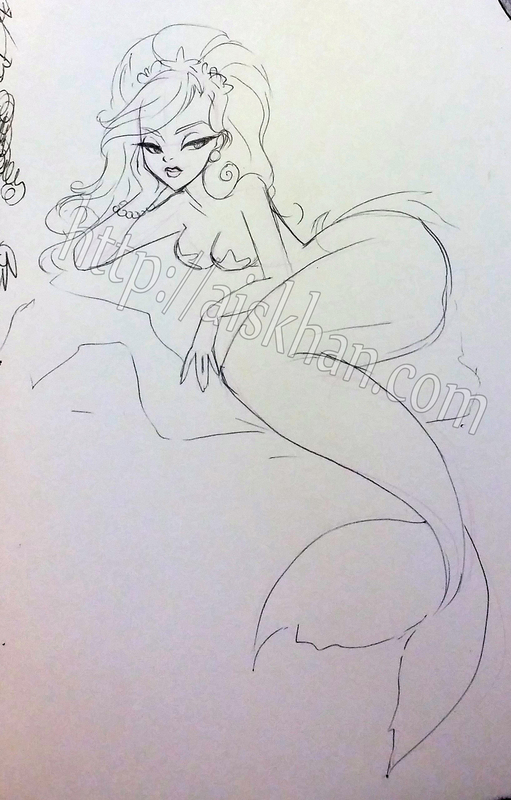 I’m really enjoying drawing these little mermaid ladies. I liked this one so much, I chose to colour her in. I added some glitter to her tail to make the scales look wet. Kuretake Brush Pens, 0.3 mm Pigment liner, glitter, glue, water. Yay! 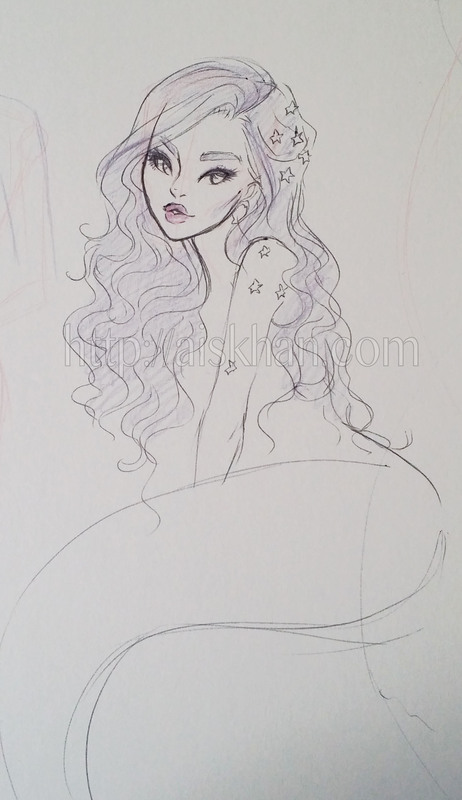 Another big-haired mermaid. She looks terribly bored, at least she’s not floating on air. 0.5 mm Black Ballpoint pen. 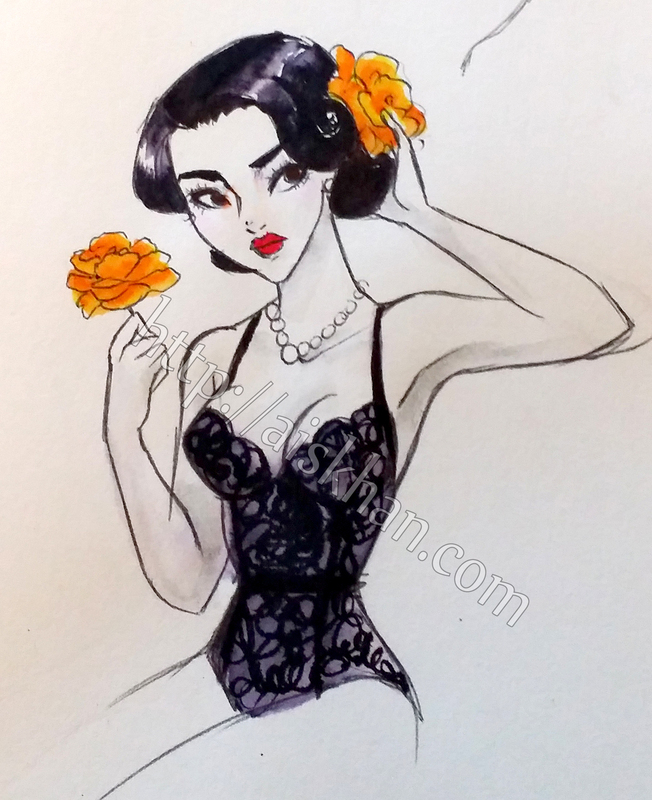 Just a quick doodle of a pretty lady getting dressed for something. Perhaps a date? Also the squiggles represent lace. Brush Pens, water, and 0.5mm Ballpoint pens.